You need it when? Fast turnaround is standard on all our trade show table covers, nearly all ship 3-business days after we finalize your artwork approval. And for the times when that’s not fast enough, rush service is also available for most table covers… always at very reasonable prices. 1/8" MINIMUM THICKNESS. All text strokes & serifs, all lines & objects must be a minimum of .125" (1/8") thick at 100% print size. DO NOT place your order online (1) if you're unable to supply your artwork as production-ready, or (2) if you're uncertain your file is production-ready. Instead, call us at 800.969.9913, or send us your logo, so we can determine how we can best help you. No design work is included in listed prices. Usage: Indoor use recommended. Suitable for outdoor usage. Shipping dimensions: 39" x 6" x 6"
Shipping: All products ship exclusively via FedEx; we do not accept third-party billing accounts. Production-ready Artwork: All pricing is based on clients submitting production-ready file(s) directly to our production department. We reserve the right to refuse or adjust any artwork not meeting our minimum imprint specifications and are not responsible for detecting errors in supplied files. Design & layout services: If you're unable to submit your artwork as production-ready, call us for a quote to properly recreate it. Production-setup fee: All table cover artwork is subject to a production-setup fee. Artwork is archived free for life for all reprints. Production turnaround: Quantities of 1-5 typically ship within 5-7 business days after we receive your signed order confirmation. Business days are regarded as Monday-Friday and exclude holidays. Production turnarounds can vary by product, quantity & color and do not include time in transit. Remember to allow additional days for shipping. 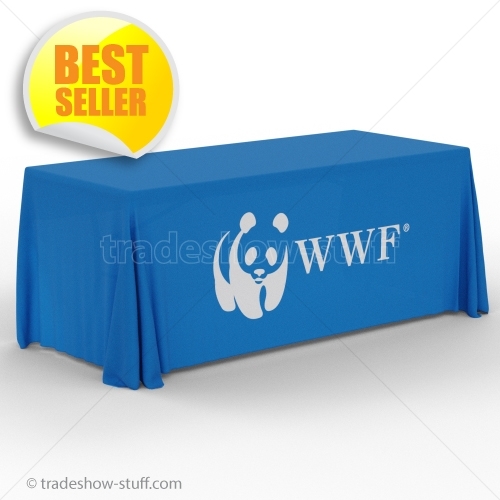 Upgraded production is available on select table coverings. Call us to confirm availability and have your artwork pre-approved for production. Quantity pricing is based on all table coverings being imprinted with the same artwork. Quantities of 6 or more require additional time; 12 or more please call 800.969.9913 for a quotation. Polyester Twill fabric: stock colors available. Dye lots can vary. Fabric; Special Order Colors: Are not available for rush production. Please allow 3 additional business days for all special order fabric colors not in stock. Special order fabric colors are non-cancelable and non-returnable. Imprint/Fabric Care; Polyester Twill: Machine wash separately on extra delicate cycle using cold water & mild detergent (Woolite®). Tumble dry on ultra low/delicate heat setting for 8-10 mins (less dry setting). Do not iron imprint; Do not bleach; Do not dry clean. 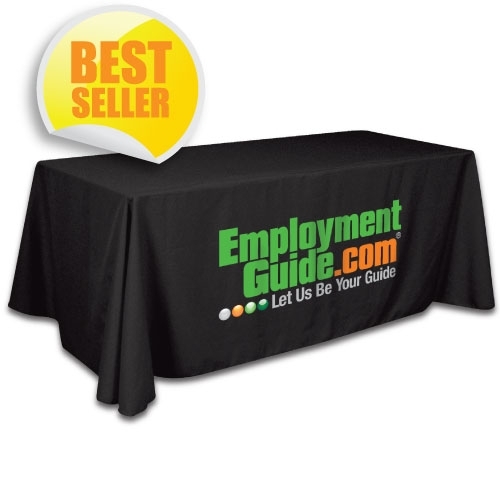 Warranty information: are imprinted table coverings are designed to provide the user with a cost effective and durable product. Our standard one year warranty covers against defects in material and workmanship. It does not cover damage due to accidents, stains, misuse, or normal wear and tear. Table Coverings found to be defective will be replaced or repaired at factory’s discretion. Order Cancellations: All cancellations must be submitted in writing. Once an order is placed, artwork is received, inspected, readied for imprinting and an order confirmation has been created that order will be charged a minimum cancellation fee of $39. Client is also responsible for all credit card charges along with all labor and material costs incurred prior to cancellation and will be billed accordingly. Once an order has been confirmed and entered into production, it is considered firm and cannot be cancelled.